Renaud Lavillenie scaled a championship best 6.02m as he won world indoor gold with ease in Portland on a night when another gold-medal favourite, Jenn Suhr, came out on top in one of the highest-quality ever women’s competitions. After being introduced into the arena at the Oregon Convention Center one by one and with no other events taking place, the pole vaulters enjoyed a rare chance to be the sole focus of attention. While the action passed back and fore between the men’s and women’s runways, background music added to the atmosphere for the spectators in the nearly full 7000-seater venue. Just two jumps was all Lavillenie needed in order to take gold in the men’s competition before going on to clear a championship record of 6.02m at his first attempt. He then responded to chants of “world record” from the knowledgeable onlookers – some of whom were seated on the green running track which will be used for days two to four – by having the bar set at 6.17m. This is one centimetre higher than the global mark he established in 2014 when he had to miss the World Indoors in Sopot due to injury sustained in that Donetsk meeting. Reminding us of the dangers involved, on the first attempt, he got half way up to the bar before landing on his feet and on the second he landed rather precariously but without injury in the pole plant area. The enthusiastic crowd gave him full support particularly for his last jump, but this was not close either. The Frenchman had gone over first time at 5.75m and 5.90m – the latter a height which only American champion Sam Kendricks was involved at. Kendricks had a perfect record at 5.40m, 5.55m, 5.65m and 5.80m. He then had one failure at 5.85m before failing to match his recent PB of 5.90m. 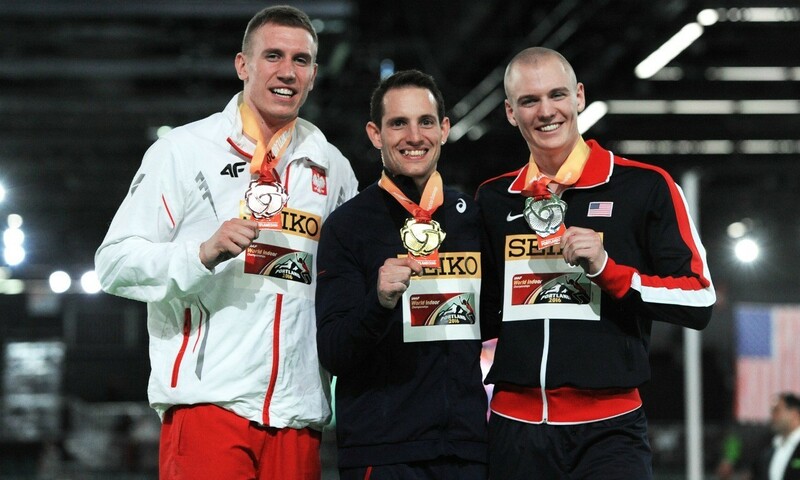 Poland’s Piotr Lisek took bronze with 5.75m. Shawn Barber, the world outdoor champion who earlier this year joined the select group of six-metre vaulters, needed three attempts to succeed at both 5.65m and 5.75m and finally finished fourth. Defending champion Konstadinos Filippidis was seventh with a best of 5.65m. Thiago Braz of Brazil, who had been third on the world indoor rankings with 5.93m, also disappointed as he placed 12th, clearing just 5.55m. Suhr prevailed in arguably the best women’s pole vault competition in history, enjoying first-time clearances at 4.60m, 4.75m, 4.85m and 4.90m. After adding world indoor gold to her 2012 Olympic title, she decided against an attempt to add a centimetre to her 5.03m world indoor record from earlier in the year, saying she was taking a precaution because of a tight calf. “This meet was tough. 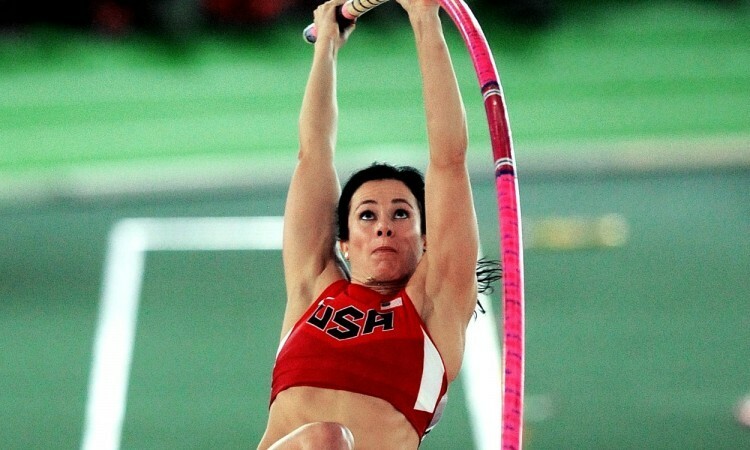 There’s a lot of good vaulters out there,” she said after her flawless performance. For the first time in history, indoors or outdoors, four women went clear at 4.80m or above. Sandi Morris, who had gone to third on the world all-time list the previous weekend at the same venue with 4.95m, took silver with 4.85m. Greece’s Ekaterini Stefanidi collected bronze with a best of 4.80m. Nicole Buchler was the surprise of the women’s competition, adding five centimetres to her Swiss record with 4.80m. Her previous best major championship position had been eighth at the 2012 World Indoors. New Zealand’s Eliza McCartney, the world junior record-holder, was 10cm below her recent outdoor breakthrough height with 4.70m in taking fifth. Fabiana Murer, the 2010 world indoor and 2011 world outdoor champion, went out with a best clearance of 5.60m, placing sixth. The drama had begun even before the opening ceremony as Australia’s Alana Boyd injured herself in warm-up and had to be taken away in a wheelchair. She was later diagnosed with a grade-two ankle ligament sprain and is expected to be out for eight weeks.